From Stephanie Morrill, author of The Lost Girl of Astor Street, comes Within These Lines, the love story of a girl and boy torn apart by racism during World War II. Evalina Cassano’s life in an Italian-American family living in San Francisco in 1941 is quiet and ordinary until she falls in love with Taichi Hamasaki, the son of Japanese immigrants. Despite the scandal it would cause and that inter-racial marriage is illegal in California, Evalina and Taichi vow they will find a way to be together. But anti-Japanese feelings erupt across the country after the attack on Pearl Harbor, and Taichi and his family are forced to give up their farm and move to an internment camp. Within These Lines is a historical young adult novel that tells the story of Evalina Cassano, a young woman whose family owns an Italian restaurant in 1942 San Francisco. She meets and falls in love with Taichi Hamasaki, the son of farmers who sell produce to the restaurant. After Pearl Harbor, Taichi's family faces terrible prejudice and they are sent to an internment camp for Japanese Americans. Evalina begins university studies in political science and volunteer work with a church that is working to help the Japanese American citizens in internment camps. Evalina and Taichi stay connected through letters, although there are many obstacles in their way. I was interested in reading this novel because I love historical fiction and knew relatively little about the plight of Japanese Americans during World War II. I am impressed with the depth of historical details and research in this novel. It was truly like entering another world. This is such an emotionally compelling, moving story. Evalina and Taichi are both such sympathetic protagonists, and I just could not put this book down. It was one of those late at night reads. I finished reading two days ago and I am still thinking about it. I found it tremendously moving to see how Taichi, his family, and the other brave Japanese families worked to maintain a sense of dignity and order and community in the midst of terrible, heartbreaking conditions. Evalina and Taichi's love story was beautifully told. They both had great strength of character and showed so much grace and courage. As well as the internment of Japanese Americans during World War II, there was also a ban in many states against interracial marriage, so they worked to overcome obstacles on several levels. I will admit this book led me to a lot of Googling. The author based a couple of supporting characters on real people, and there are photos of them online. There is also a Wikipedia page about Manzanar, the internment camp where the Hamasaki family was relocated. The author, Stephanie Morrill, mentions a two part podcast episode about Executive Order 9066 and Japanese Internments at Stuff You Missed in History Class. This is a podcast I enjoy, although I had not heard these episodes before. 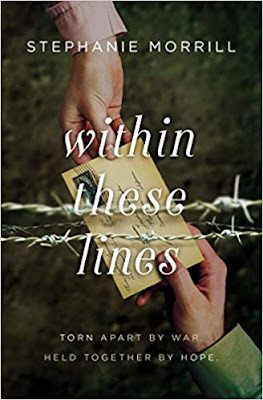 Within These Lines would be an exceptional book group discussion book, and I think it would be a particularly powerful read for older high school or college students. I give it the highest recommendation for fans of historical fiction. It is a book I will not forget, and it is certain to be on my list of favorite reads from 2019. 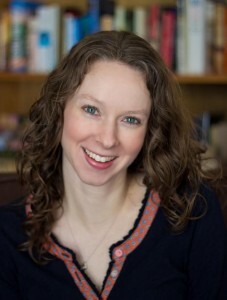 Stephanie Morrill is the creator of GoTeenWriters.com and the author of several young adult novels, including the historical mystery, The Lost Girl of Astor Street. Despite loving cloche hats and drop-waist dresses, Stephanie would have been a terrible flapper because she can’t do the Charleston and looks awful with bobbed hair. She and her near-constant ponytail live in Kansas City with her husband and three kids. I agree, I think this would be a great book for a book club discussion! Thanks for being on this tour!